Jolly Roger Skateboards: PRESS FOR SALE: Print Your Own Tees and Skateboard Decks! 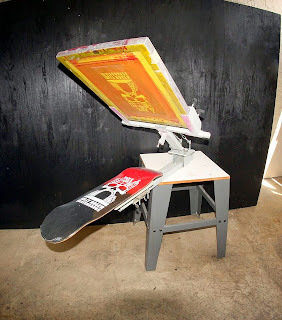 PRESS FOR SALE: Print Your Own Tees and Skateboard Decks! We are trying to make room for new equipment and we are selling this Lawson "Beta 11" One Color Press for only $400. It comes with a t-shirt platen so you will be set up to print one color tees (screen not included). If you want to be able to print skateboard decks, add $175. and we will throw in a Skate Mate platen that is all you need to start printing your own decks. This is the same press that we used in our Skate Mate promo video > https://youtu.be/bZ1PcAyCrzw so you can see it in action. If you are interested, stop by and pick it up. First come, first serve. The blog is written in simple English with no aspiration towards literature. Indeed, even the words like charming and intriguing can't do full equity with regards to depicting this blog.